Well, the final hurrah of the year is over. The show duds have been packed away until year. The self-imposed stress of horse shows is behind us and we can get back to just training…after Ike enjoys a few days of well earned down time. Our Second Level championship ride had a major spook, but the rest of the test was solid and our score enough for an eighth place ribbon. While it now resides next to the two we earned at Training and First Levels, it somehow has an extra special place in my heart. This year was a big one for us. It was the first year ever that our shows did not include any of the lower levels. This was the year that I felt that Ike and I truly connected – collection is possible and I have seen glimpses of the still untapped power. The falling acorns helped me find my medium trot and Ike’s passage. It is scary and thrilling all at the same time. But most of all, I marvel at the awesome group of friends who I have met through my equine endeavors and who share this grand adventure. We all arrived at this point by different paths, yet as we sat together in the barn this weekend, it didn’t matter how we got there. We were all there to enjoy our horses and cheer for each other. Strangers became life long friends. Fellow competitors morph into friendly faces and you cheer for their success. You volunteer your time to help the show run smoothly and sometimes you can turn someone’s day around by wishing them luck or congratulating their nice ride. Horsepower is a good thing, but the power of the horse is something truly amazing. To all my friends, I cherish you all and look forward to our future adventures. Move over Frankenstein (or Fraank-en-shteen if you are more of a Mel Brooks fan), there is a new monster in town to terrorize the villagers. 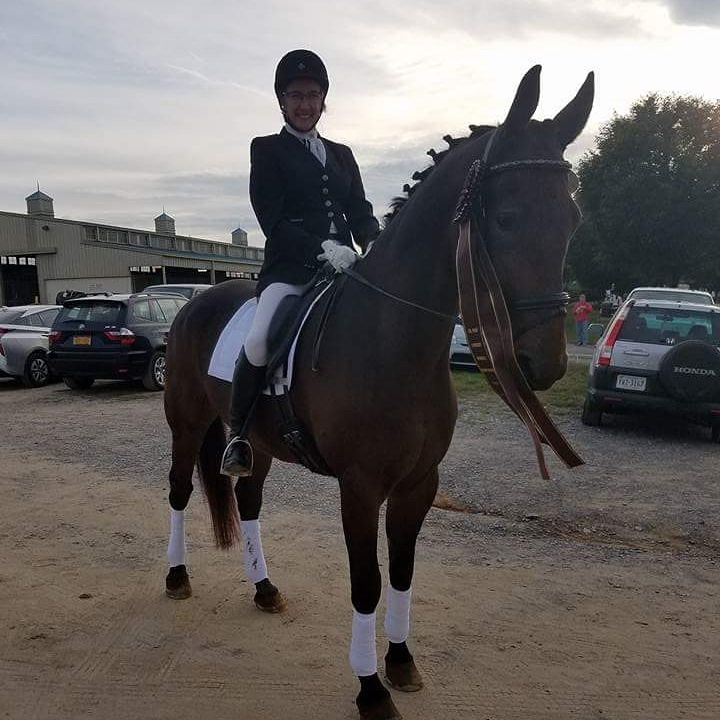 If you are attending a dressage show in the mid-Atlantic area this year, keep your eye out for Frankenhorse. This creature is typically one of the larger equines in attendance with a ginormous, block-like head and a long bed body. He might look like any ordinary horse, but if you look closely at the button braids, they will be hiding the bolts in his neck. In the stabling area, you might see him dragging around a young-ish maiden as he bulls his way to the nearest grass patch. Stud chains and lead ropes are no match for this monster who can be very single minded when hunger pains strike . It is suggested that you just step aside and let him pass rather than risk having him dent your $800 Deniro boots and/or your foot with his sizeable hooves. If you see him in his stall, do not be fooled by the friendly expression on his face as he watches your approach toward his temporary living quarters. Frankenhorse’s long neck makes easy work of nipping at unsuspecting passersby. Barn visitors should also be wary of flying feed buckets. This monster can be very grumpy when hungry. You might consider wearing your riding helmet when visiting the barn housing this creature. Frankenhorse typically reveals his awkward self during the more challenging movements in the Second Level tests, so mosey over to the ring to catch a glimpse of the Second Level classes to see this creature in action. Ten meter circles are more hexagonal than circular since a supple midsection is not typically seen on a FH. Countercanter is also not FH’s strong suite since that also requires a supple body rather than bullish shoulders and a board-like ribcage. Most often, FH gives himself away with the turn on the haunches. That movement exaggerates FH’s stiffness. If you are quiet and listen very closely, you will hear him grunt and groan when asked for the turn. Pinned ears and a swishing tale are also telltale signs that you are watching a Frankenhorse. Thankfully, with regular work, timely feeding, and appropriate training to keep his mind occupied, Frankenhorse’s reign of terror can be minimized and peace can be maintained.